The fact that the majority of carrots grown before the 17th century were purple is one of them strange, largely pointless facts that everyone knows, nobody really cares about and yet always comes up on quiz night at the local pub. 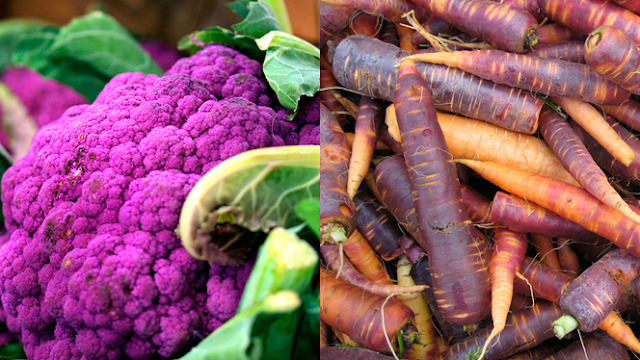 It wasn’t until Dutch growers began developing mutant strains of the purple carrot in order to create a sweeter variety that the orange hue typically seen today emerged. As we enter 2017 however, purple food seems to be making a comeback in a big way. This is according to trend-spotters at Whole Foods Market, who studied buying trends across the retailer’s 465+ stores in order to identify how the market may change in 2017. They identified 10 key trends for the coming year, including ‘flexitarian’ diets, creative condiments, products from by-products and the aforementioned surge in the popularity of purple food. “Richly colored purple foods are popping up everywhere: purple cauliflower, black rice, purple asparagus, elderberries, acai, purple sweet potatoes, purple corn and cereal. In simple terms, the darker and more vivid the purple colouration is, the higher the concentration of antioxidants and nutrients. They’re not the only ones to praise the ‘power of purple’ either. Matthew Plowman, a Nutrition Adviser at Cardiff Sports Nutrition, told the Telegraph, "The benefits of antioxidants have long been discussed, but they are known to fight disease, keep you looking younger, reduce inflammation and are good for your heart – basically, why wouldn’t you eat them?" On top of all that, a recent health and nutrition study also found that those who regularly consume purple food often have a reduced risk of high blood pressure and low cholesterol, so the benefits really do keep stacking up. Plowman attributed the rise of purple cuisine and other food trends to not only an increasingly health conscious population, but also social media. He argues that social platforms filled with health bloggers, nutritionists and dietitians, each sharing their own health tips and culinary creations, has led to increased awareness of the benefits of many of these more unusual foodstuffs in the population at large.